On the night of December 20/21, the night of the full lunar eclipse, Hunter made a rukus outside about 10 PM. His urgent barking told us something, or someone, was too close to his yard for his liking, so we grabbed the flashlight and went out to investigate. without flash. It's basically the view we had of her, a little out of focus, because there was just not enough light. This shot was taken with the flash, and a zoom lense, it grabs all the detail in that instant. The flash and all our fuss didn't seem to faze her; she stayed put and watched us from her high perch. Don't know how long she stayed. We finally went back inside and went to bed. Got up, later, about 1:30 AM to try and see the eclipse. She was gone, then, and the sky was too cloudy to make out any more than the darkened moon. 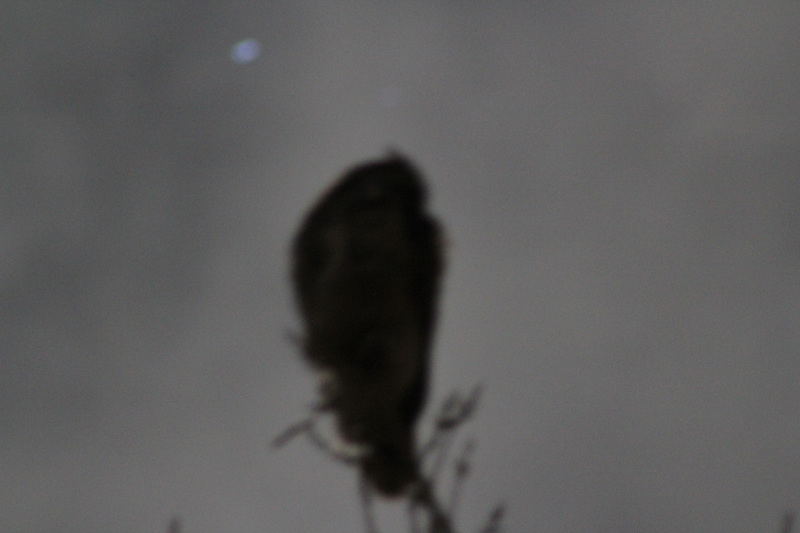 This is the third owl that has visited our place, the third we've seen and been able to take photos of, anyway. I have a feeling that she might be the mother of the young male owl that paid a visit to our chicken coop around Thanksgiving. She was a mature female Great Horned Owl, about 24" tall, and while they weigh only about 4 lbs (which is why she can so easily perch herself on those new growth branches at the very top of a 25 foot tall tree), they have a five foot wingspan and can hunt, kill and carry off prey weighing up to 15 lbs, which is why I am constantly on the alert and concerned for my littlest dog, who weighs only 11 lbs. From high perches, they dive down with wings folded, silently snatching their prey. Prey is usually killed instantly with their large, fierce talons. They also hunt by walking on the ground to capture small prey, even walking boldly into chicken coops, like the young male owl did in our chicken coop and another owl did earlier. Their prey list is almost endless: virtually anything they can kill, mammal, bird or reptile, even insects and road kill. Their only natural enemy, besides Man, is other Great Horned Owls. That explains why they show absolutely no fear in our presence. They are at the top of the food chain in most areas. They range throughout North America from the northern treeline, south to Central and South America from dense forests, deserts and plains to city parks. More and more, they have begun inhabiting cities and suburbs, preying on cats and small dogs. Do you have an owl in your backyard? For those curious about the fate of the young male owl we rescued after he was injured while raiding our hen house, he is doing just fine. During his altercation with our rooster, he apparently lost several of his long flight feathers, which made it impossible for him to fly. He would have died, probably at the beaks of the ravens, had we not rescued him, but surely from starvation. Once he has molted and re-grown his flights, he will be released back into his native habitat. In the meantime, he's well cared for in a large flight with two other rescued owls, dining on mice and other species-appropriate meals.